Packers Everywhere invites fans to bring the spirit of Green Bay on the road for free Packers pep rallies each season. 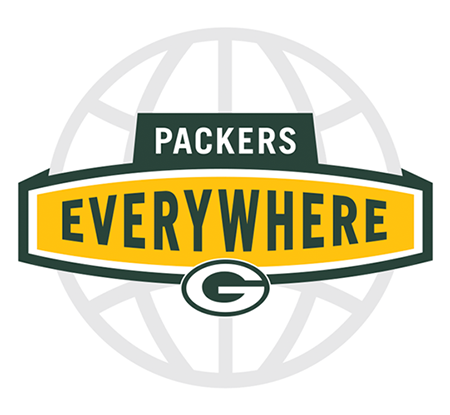 The 2019 Packers Everywhere pep rallies will be announced in August of 2019. The pep rallies welcome fans to share their excitement for the next day’s matchup and each rally will include a program hosted by the radio voice of the Packers, Wayne Larrivee. The rallies will feature Packers President/CEO Mark Murphy and various Packers alumni, who will socialize with fans and be available for photos. Each event will also include a roundtable discussion with Packers.com’s Mike Spofford and Wes Hodkiewicz, and attendees will have opportunities to win autographed raffle prizes and giveaways. Saturday, November 24, 2018 at 6 p.m. The Packers Everywhere pep rally will be hosted on Saturday, Nov. 24, in Minneapolis, Minn., the day before the Packers-Vikings game. The festivities will take place Cowboy Jack’s, located at 126 N 5th St., Minneapolis, Minn. Cowboy Jack’s will open at 10 a.m., with Packers prizing beginning at 4 p.m. The program will begin at 6 p.m.
Packers President/CEO Mark Murphy will take part in the pre-gameday excitement by greeting fans and participating in a Q-and-A session with the radio voice of the Packers, Wayne Larrivee. Packers alumni Esera Tuaolo and Lindsay Knapp will be in attendance to socialize and take photos with fans. Saturday, October 27, 2018 at 6 p.m. The Packers Everywhere pep rally was hosted on Saturday, Oct. 27, in Los Angeles, Calif., the day before the Packers-Rams game. The festivities took place at Tom’s Urban at L.A. Live, located at 1011 S Figueroa St. B 101., Los Angeles. Packers President/CEO Mark Murphy took part in the pre-gameday excitement by greeting fans and participating in a Q-and-A session with the radio voice of the Packers, Wayne Larrivee. Packers alumni John Brockington and Willie Buchanon were also in attendance to socialize and take photos with fans. Saturday, September 22, 2018 at 6 p.m. The Packers Everywhere pep rally was hosted on Saturday, Sept. 22, in Washington D.C., the day before the Packers-Redskins game. The festivities took place at the Clarendon Grill - 1101 N Highland St., Arlington, Va.
Packers President/CEO Mark Murphy took part in the pre-gameday excitement by greeting fans and participating in a Q-and-A session with the radio voice of the Packers, Wayne Larrivee. Packers alumni Bernardo Harris and Robert Brown were in attendance to socialize and take photos with fans. Packers Everywhere will host additional rallies in Los Angeles and in Minneapolis. Packers fans are invited to bring the spirit of Green Bay to three away games this season with Packers Everywhere Pep Rallies set for Washington D.C., Los Angeles and Minnesota. In Washington D.C., the festivities will take place at 6 p.m. EDT on Saturday, Sept. 22, at Clarendon Grill, located at 1101 N Highland St., Arlington, Va. The rally in Los Angeles will be held at 6 p.m. PDT on Saturday, Oct. 27, at Tom’s Urban at LA Live, located at 1011 S Figueroa St B101., Los Angeles, Calif. The event in Minneapolis, Minn., will take place at 6 p.m. CST on Saturday, Nov. 24, at Cowboy Jack’s, located at 126 N 5th St., Minneapolis, Minn.
Additional information for each rally will be announced as the dates approach. Saturday, December 16, 2017 at 6 p.m. The Packers Everywhere pep rally was hosted on Saturday, Dec. 16 in Charlotte the day before the Packers-Panthers game. The festivities took place at Whisky River - 210 E Trade St., Charlotte. Packers President/CEO Mark Murphy took part in the pre-gameday excitement by greeting fans and participating in a Q-and-A session with the radio voice of the Packers, Wayne Larrivee. Packers alumni Vonta Leach and Colin Cole socialized and took photos with fans. Fans at the rally had the opportunity to win prizes including autographed merchandise, Packers Pro Shop gift cards and other great prizes by signing up for Packers Pass. Saturday, November 25, 2017 at 6 p.m. The Packers Everywhere pep rally was hosted on Saturday, Nov. 25 in Pittsburgh the day before the Packers-Steelers game. The festivities took place at Hough's Taproom & Brewpub - 563 Greenfield Ave., Pittsburgh. Packers President/CEO Mark Murphy took part in the pre-gameday excitement by greeting fans and participating in a Q-and-A session with the radio voice of the Packers, Wayne Larrivee. Packers alumnus and Hall of Famer Dave Robinson socialized and took photos with fans. Packers Everywhere will host another rally in Charlotte, N.C., in December during the weekend of the Packers-Panthers game. Saturday, October 7, 2017 at 6 p.m. The Packers Everywhere pep rally was hosted on Saturday, Oct. 7 in Dallas the day before the Packers-Cowboys game. The festivities took place at The Rustic - 3656 Howell St. in Dallas. Packers President/CEO Mark Murphy took part in the pre-gameday excitement by greeting fans and participating in a Q-and-A session with the radio voice of the Packers, Wayne Larrivee. Packers alumni Bubba Franks and Craig Nall socialized and took photos with fans. Fans at the rally had opportunities to win prizes including autographed merchandise, Packers Pro Shop gift cards and other great prizes by signing up for Packers Pass. In addition to the pep rally in Dallas, the Packers will be hosting rallies in Pittsburgh and North Carolina this season. Saturday, January 21 at 6:00 p.m.
Over 1,700 Packers fans gathered at Park Tavern in Atlanta the day before the Packers-Falcons NFC Championship for a free Packers Everywhere Pep Rally. Packers alumni Don Majkowski, Ezra Johnson and David Whitehurst attended the rally to take photos with fans and discuss their thoughts on the matchup between the Packers and the Falcons. Saturday, January 14 at 6:30 p.m.
Packers hosted a Packers Everywhere Pep Rally on Saturday, Jan. 14 in Dallas the day before the Packers-Cowboys Divisional Round playoff. The festivities took place at Gilley’s Dallas – South Side Music Hall, located at 1135 S. Lamar St. in Dallas. Packers President/CEO Mark Murphy will took part in the pre-gameday pep rally activities by greeting fans and participating in a Q-and-A session with emcee Wayne Larrivee, radio voice of the Green Bay Packers. Packers alumni Donny Anderson, Earl Dotson and Marco Rivera also attended the rally to take photos with fans and discuss their thoughts on the matchup between the Packers and the Cowboys. To conclude the event, Packers.com’s Mike Spofford and Wes Hodkiewicz took the stage to preview the next day’s game. Saturday, January 7, 2017 at 6 p.m.
Packers fans brought their energy and excitement for Sunday’s Packers-Giants Wild Card game to Lambeau Field a day early for a free Packers Everywhere Pep Rally at the Tundra Tailgate Zone (TTZ) on Saturday, Jan. 7, at 6 p.m. CST. Packers President/CEO Mark Murphy took part in the pre-gameday pep rally activities by greeting fans and participating in a Q-and-A session with emcee Wayne Larrivee, radio voice of the Green Bay Packers. Packers alumni Dorsey Levens and Ahman Green attended the rally and took photos with fans. The event was concluded by a preview of the next day's game by Packers.com’s Mike Spofford and Wes Hodkiewicz. Saturday, Nov. 12, 2016 at 6 p.m.
Packers fans flooded Nashville for the Packers-Titans game. The weekend started with a #PackEverywhere pep rally on Saturday, Nov. 12 at the Wildhorse Saloon. The event was hosted by the radio voice of the Packers, Wayne Larrivee and included appearances by Packers President/CEO Mark Murphy, Packers alumni Chad Clifton and Scott Wells, and Packers.com's Mike Spofford and Wes Hodkiewicz. Following the pep rally the Wildhorse Saloon featured a live band and line dancing. Saturday, Oct. 29, 2016 at 6 p.m.
Packers fans gathered in Atlanta on Saturday, October 29 for a Packers Everywhere pep rally at the Hard Rock Cafe. Packers alumni Dorsey Levens and Vonnie Holliday socialized with fans, signed autographs and shared their thoughts on the Packers-Falcons match-up. Packers President/CEO Mark Murphy, Packers.com's Mike Spofford and Wes Hodkiewicz and the radio voice of the Packers, Wayne Larrivee all were also in attendance. Saturday, Sept. 17, 2016 at 6 p.m.
Packers fans gathered at The Pourhouse in Minneapolis on Saturday, Sept. 17, 2016 to show their Packers pride. Packers alumni Jim Carter and Lindsay Knapp socialized with fans and signed autographs. The program was hosted by Packers analyst Larry McCarren. Appearances were also made by Packers President/CEO Mark Murphy, Mike Spofford and Wes Hodkiewicz. Saturday, Sept. 10, 2016 at 6 p.m.
Packers fans gathered at Blackfinn Ameripub on Saturday, Sep 10 to help kick off the 2016 season the day before the Packers-Jaguars season opener. The event included a program with Packers President/CEO Mark Murphy and Packers alumni Nick Collins and LeRoy Butler, who socialized with fans and signed autographs. A roundtable discussion with Packers.com’s Mike Spofford and Wes Hodkiewicz was also part of the event agenda. Attendees at the event also had opportunities to win autographed raffle prizes and receive Packers giveaways. Packers fans celebrated the 2016 Pro Football Hall of Fame Enshrinement Weekend with a free Packers Everywhere Pep Rally on Saturday, Aug. 6, at 4 p.m. The festivities took place at Whiskey Ranch, located at 4919 Mt. Pleasant St. NW, Green, Ohio. Packers alumni LeRoy Butler, Mark Chmura, Robert Ferguson, Antonio Freeman, William Henderson and Marco Rivera were all present at the rally. The alumni took to the stage to recall their playing days, socialized with fans, signed autographs and gave their thoughts on the upcoming Packers season and the next day’s Packers-Colts preseason game. The day before the Packers-Cardinals divisional round playoff game Packers Everywhere hosted a pep rally at the Sandbar Mexican Grill in Scottsdale, Arizona. Packer greats William Henderson and Frank Winters joined in the fun as well. Packers fans brought their energy and excitement to the Washington, D.C., area for a Packers Everywhere Pep Rally on the eve of the Wild Card game. Packers alumni Nick Barnett and Nick Collins signed autographs and mingled with fans. The Green Bay Packers hosted a pep rally for fans at Clancy's Pizza & Pub in Scottsdale on the night before the Packers-Cardinals Dec. 27 matchup. Packers Hall of Famers Lynn Dickey & Paul Coffman joined the festivities. Packers fans turned out for a Packers Everywhere pep rally in San Jose on Saturday, October 3, 2015 to get pumped up for the Packers-49ers game the next day. Packers alumni Antonio Freeman and Derrick Mayes were in attendance to greet fans and sign autographs. The Green Bay Packers hosted a free pep rally event for fans in Seattle on Saturday. The rally was held at the Mustard Seed Grill & Pub on the eve of the NFC Championship. Fans gathered in the Tundra Tailgate Zone on Thursday night for a final pep rally before the team departed for the NFC Championship game in Seattle. Guard Josh Sitton and tight end Andrew Quarless, as well as Packers alumni Antonio Freeman and Doug Evans, were in attendance. Packers alumni recall the 1967 Ice Bowl during their appearance at Lambeau Field for a pep rally on January 10, 2015 to get fans pumped up for the Packers- Cowboys NFC divisional playoff game. Packers alumni Nick Collins and Kenny Stills visit with fans on a two-stop Packers Everywhere pep rally at Ferg's Sports Bar and Grill (St. Petersburg) and The Varsity Club (Clearwater) on Saturday, December 21, prior to the Packers-Buccaneers matchup at Raymond James Stadium. Fans turned out in big numbers to a pep rally at Will's Northwoods Inn in Chicago on Saturday, Sept. 27, 2014. Don Beebe, Mark Chmura, and Paul Hornung made appearances at the pep rally.